Music Editing Master works with all audio formats. Here's some sweet music for your ears, if not for your eyes. Music Editing Master is a flexible and highly functional music-editing program. It has all the standard music-editing features, including invert, normalize, fade in and out, reverse, and reverberate. The interface is much more straightforward than in past versions, and most functions are just a button-click away. Beginners should find Music Editing Master easier to use than most of its competitors. The free trial provides ample opportunity to take this editing application for a spin. Overall, Music Editing Master is a good tool for mix masters and music fans looking to create their own home studio. If one fine day you come up with a brilliant idea to record your very own clip or just borrow the theme for it from a movie you liked, chances are you will be disappointed to find out that your operating system does not have any software for editing audio records, not to mention the rest. So, would you just give up your dream? — No way: fight for it and get an audio editor from a more attentive vendor. 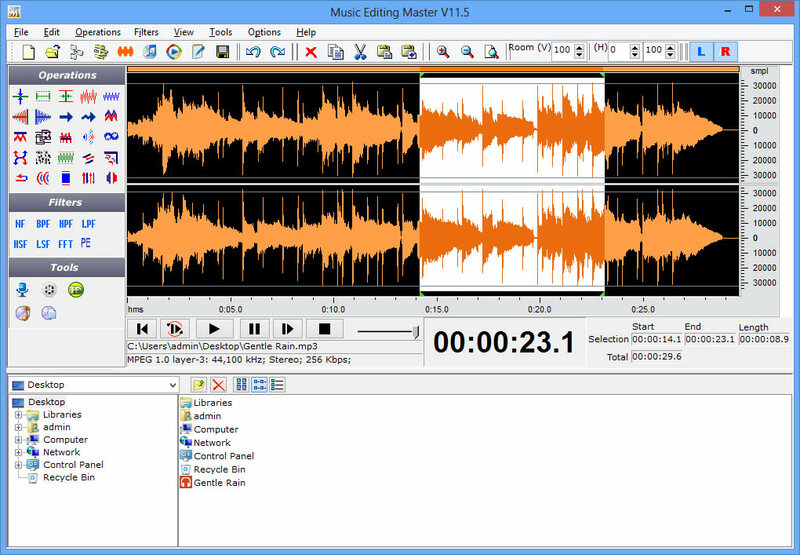 Take a look at Music Editing Master — a friendly and powerful application for editing audio records, cutting out unnecessary pieces, mixing multiple tracks, applying special effects, etc., recording audio through microphone or line-in channel, grabbing audio content from movies, converting audio files form and to the majority of audio formats and burn the result on disk without involving external software, and a lot more. Certainly, such extensive list of functions doesn’t contribute to squeezing the application’s size; nevertheless, the software doesn’t take much time to get along with. To get started, you can simply drop the files (any number of files) you need to process onto the application window and start editing them. Besides the actual sound, you can edit the properties of the output file: album, artist, comments, genre, title, etc. With a collection of advanced sound effects and professional filters, you can quickly improve your record, and when the output is ready — save it to the format you like or... insert it into a movie and create your own video clip. Well, converting between audio formats is no longer a novelty. How about converting text to speech and recording the speech to an audio file? — Music Editing Master can do that too, and still has a lot to offer.